Need for Speed: ProStreet is a popular racing game published by Electronic Arts in 2007. 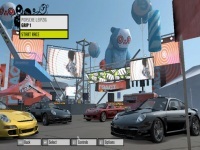 In this demo version, Users can play two Porsche cars : 911 GT2 and 911 GT3RS on the Porsche testing track in Leipzig. Unlike the other series, ProStreet features legal racing on official race tracks such as Leipzig on-road circuit. Ryan Cooper is the street racer that joins the challenge. Use nitro boost to chase after front cars and become the first winner. Up, Left/Right, and Down Keys = Accelerate, steer, and brake. Ctrl / Shift = Shift up or down. C, R, B = Change camera, Reset Car, and Look Back. For better graphics experience, go to Options menu and set the game resolution to 800 x 600 or higher.